Topics: Services, Team, Projects, & Contacts. It is hosted by Internetnamesforbusiness.com (Florida, Fort Lauderdale,) using Apache/2 web server. Its 3 nameservers are ns3.meganameservers.com, ns1.meganameservers.com, & ns2.meganameservers.com. 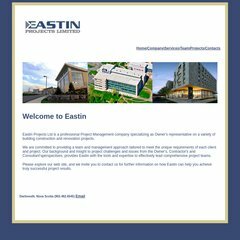 Eastin.ca's server IP number is 69.49.101.54. PING www. (69.49.101.54) 56(84) bytes of data.